Today’s guest post is from Susi, a writer for Arcadian Lighting, a must-shop resource for beautiful lighting fixtures. ‘Tis the season for living outdoors and Susi is going to share with us some of her finds for innovative outdoor lighting that have a contemporary style to it. Contemporary outdoor lighting focuses on innovative materials, interesting design and sleek lines. Solar lights and battery powered LED lights have allowed contemporary outdoor lighting to push the edge of design possibility. Contemporary planter with interesting cutout patterns by day, interesting outdoor lighting by night. These planters have sleek lines that will suit a variety of plants. Glowing globes turn a pool into an interesting focal point at night. These globes can be placed throughout the garden or landscape to add nighttime interest. How do you hang a pendant light over an outdoor table? This clever design uses cables to support an overhead light in an open patio. Brilliant! Uplighting can add drama and interest to any outdoor living space. While these lights are hardwired, portable LED lights or solar lights, and even large votive candles could create a similar effect. The Halley Lamp by Vibia contains a bar of LED lights that can transform your outdoor dining space or create arches in the garden to greet guests. Lightweight and portable and very cool. This is a clever DIY project from John Giacomazzi, owner of Area in San Francisco. The glass orbs surround a single bulb. Gorgeous hung in a tree or on a patio. Vibia, the same designers who created the Halley Lamp above, also made outdoor pendant lighting that feels more like high end indoor lights. Love the color! And finally, a tried and true outdoor lighting idea, the paper lantern. 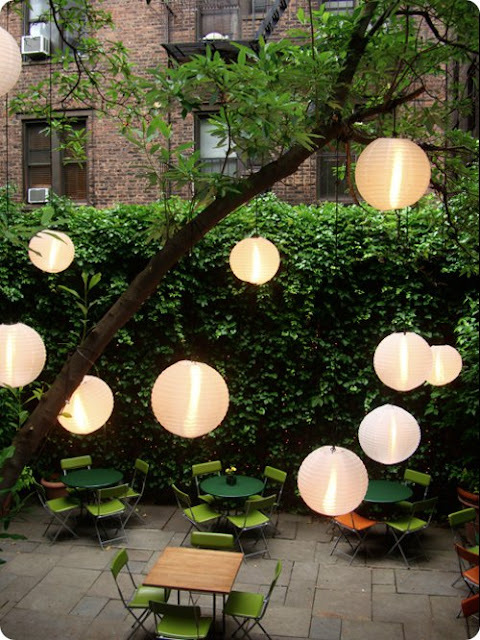 These lanterns can now be solar powered and easily hung in trees to create a landscape of floating orbs of light. Previous articleThe green stuff is creating wall art for the garden.